This is a big update, and Apple also released updates to tvOS and watchOS. 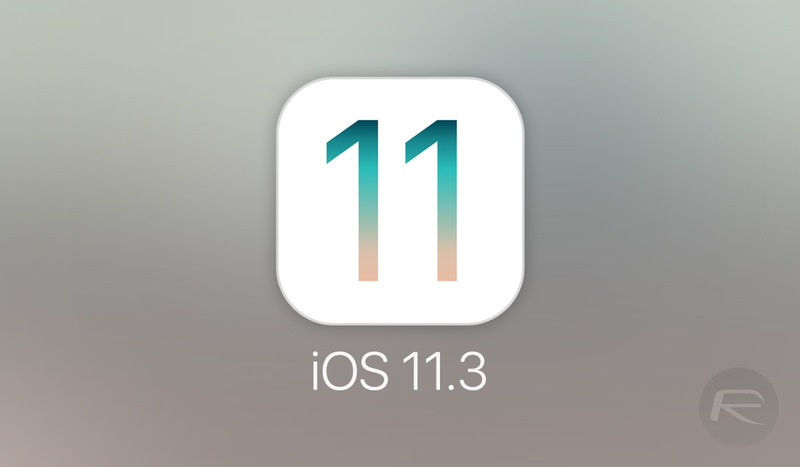 Apple released iOS 11.3 to all supported devices, including the iPad Air and later, the iPad mini 2 and later, the iPhone 5S and later, and the sixth-generation iPod touch. The update is available for download now in supported regions. With several new features, it's arguably the biggest update to iOS since iOS 11 first released. iOS 11.3 addresses battery-based performance throttling on older devices, adds significant new capabilities for augmented reality, adds the ability to chat with customer support reps from companies in Messages, and lets users access their personal health records in the Health app. There is now a section in the Settings app, nested under "Battery," called "Battery Health." If you visit this on a phone with a battery Apple deems healthy, it will simply serve up brief copy explaining some key concerns with iPhone batteries, along with a link to a webpage that goes into more detail. It will also show a value for "maximum capacity." This value is a percentage. Notably, performance management is disabled until the phone first experiences an unexpected shutdown; it's not activated simply by a maximum capacity below a certain value, and you can't turn it on unless you've run into the problem. The note about the Apple Authorized Service Provider is meant to address a consumer complaint that Apple was not transparent with users about the option to upgrade the battery—that complaint is key in the class-action lawsuits that have popped up in response to the performance management controversy that began last December when Reddit users and the dev behind benchmarking app Geekbench confirmed that iOS throttled performance on devices with underperforming batteries. Apple does not offer this feature on iPads, but this update does add a new iPad feature called "charge management." The update notes say it "maintains battery health when iPad is connected to power for prolonged periods of time, such as when it is used in kiosks, point-of-sale systems, or stored in charging carts." Those are the major features in iOS 11.3, but Apple added a few small things as well. Software authentication of HomeKit-compatible devices increases the number of devices that can support HomeKit. Support for the Advanced Mobile Location (AML) standard gives emergency responders in supported countries more accurate location information when responding to an emergency call. A new "For You" section has been added to Apple News, offering more personalized selections, and you can now sort App Store reviews in new ways, including "most critical," "most favorable," "most recent," and "most helpful." There are numerous bug fixes, addressing issues like failed incoming calls when waking the display, Mail messages reappearing in notifications after they've already been read, and parents' inability to use Face ID to approve purchase requests from their children on the iPhone X.
Apple has expanded its efforts to loop users in on when and how their personal data is being accessed or used by the company's apps and features. First off, it has added a new icon to represent user privacy that appears to notify users whenever Apple is doing something with their personal information. Each instance of this comes with a brief explanation of what information is being accessed and why, with a small link to a more detailed page that goes into greater detail. iOS 11.3 adds the ability to chat with representatives from participating companies directly in your Messages app. It's essentially a platform for text-message-based customer support. The conversation can be triggered by tapping the Messages icon that appears in the Safari or Apple Maps apps, as well as in iOS searches. In the course of the conversation, you can use Apple Pay for transactions without leaving the app. If you need to set an appointment, a menu listing available times will swipe up from the bottom of the screen. Apple claims no personally identifiable data is shared with the companies unless you share it yourself and that businesses cannot start conversations—users have to initiate. Like the Battery Health settings, Business Chat is listed as a beta feature. Apple's health-related efforts aren't always the most-touted developments by tech enthusiasts, but they've been a significant area of focus for the company lately. In iOS 11.3, Apple has added Health Records to the Health app. This feature allows you to connect to various health records networks in which your providers participate, and it collects all those records in one place, even though your providers might use completely different networks and systems. ARKit is Apple's augmented reality application programming interface. Apple introduced ARKit at its Worldwide Developers Conference (WWDC) last year. The framework handles some of the lower-level heavy lifting for augmented reality so developers can focus on customization of its experiences and on content. Previously, ARKit could only accurately place objects on flat, horizontal planes, limiting the range of applications developers could make. With ARKit 1.5, developers can now place objects on vertical planes like walls, and accuracy is improved when mapping objects onto surfaces that aren't completely flat. It also adds image-recognition capabilities. For example, an AR app could show a full-sized robot if a poster for an associated robot movie is seen by the phone's camera, or it could provide additional context in a museum when a certain painting is seen. Apple touts a "higher-resolution real-world camera view when using AR experiences," and auto-focus is now supported in AR views as well. AR is a major focus for Apple this year; it has been the subject of many of the company's top executives' comments about their strategy and new initiatives, and many of the major additions and updates in the iPhone 8, iPhone 8 Plus, and iPhone X—all released late last year—were focused on laying the ground work for improved AR experiences, either with new sensors or improved performance. Tim Cook has said he believes AR will be a watershed moment for the app store once AR developers find their stride. App intelligence firm Sensor Tower recently estimated that apps built on ARKit have been downloaded 13 million times since iOS 11's initial release. Half of those apps are games, but Pokémon Go and several other popular AR apps are not included in those numbers because, for all or some of the reported period, they were not built on ARKit. This update also adds four new Animoji for the iPhone X: a skeleton, a lion, a dragon, and a bear—not to be confused with the existing panda bear Animoji. They're pictured below. These new Animoji don't add any new functionality; they're just new skins for the TrueDepth sensor-based, iPhone X-exclusive feature. not giving up my jailbreak for it. jailbroken 11.0.3 is just fine for me. my girl updated to this yesterday and tonight her 6+S went black and had a red line on the screen then rebooted to apple logo and keeps rebooting. i tried to restore but at the first boot the apple logo shows and the line appears underneath then it reboots again..any help would be appreciated. Try reinstalling from dfu mode again. Yet another reason to stay as far away from 11.3 has been uncovered. Once again the sneaky engineers at Apple have inserted code to detect if your phone has been repaired by anyone but Apple, particularly the sceeen this time out, and if so, it will disable the touchscreen making your phone nye impossible to use. Apple hates third party repairs and hates you for not paying their exhorbitant repair costs. This is rediculouse what Apple are doing. I had my iphone 6s screen replaced by a unofficial person and it works fine? The "feature" only seems to be affecting Iphone 8 and X. Your 6S is 3 generations old. Apple doesn't care about hindering you anymore. They pushed it on my iPad Pro with out me approving it. worst update 11.3 regretted to update. Apparently ios 11.3.1 fixes this issue. It also includes security patches. Jailbreakers stay away. Currently on 11.2.6 , should i upgrade to 11.3 or stay ?